It’s no secret that our unique bike chain cufflinks are one of our best selling items. We are blessed to receive consistent positive feedback from happy customers who order them for themselves (or as gifts for a lucky recipient). Today we will be digging through the feedback we have received so far to share with you some of the many reasons our customers were (and continue to be) happy with their purchase of our cufflinks. Let’s start with the most obvious thing people love about our cufflinks – they’re unique. We’ve searched high and low, and there are very few other companies (if any) that produce something that even slightly resembles our products. The cufflinks our skilled craftsmen create are unique, handmade, one of a kind pieces that you’re not going to find anywhere else. We have many customers writing to us telling us about how many compliments they receive whenever their bike chain cufflinks are noticed. As soon as you mention that they are made from a real bike chain it’s almost inevitable that people are going to ask for a closer look. We even hear of occasional anecdotal stories about how friendships were formed (and even a relationship or two started) based on the back of a conversation that began about our cufflinks. It can often be a little difficult to find the perfect gift for the cycling enthusiasts in our lives. Most cycling themed gifts are on the novelty side of things (or are a little bit “tacky” to say the least). Gifting cycling equipment isn’t usually a good idea either. It’s generally highly personal and reasonably specialised (so it’s easy to run the risk of buying something unsuitable for the recipient). We receive many comments and emails commending us on creating the perfect cycling themed gift. It wasn’t our intention to fill this clearly sizable gap in the market with these cufflinks (we just wanted to make something beautiful), but it seems we unintentionally succeeded. We’re proud to say that all of our cufflinks are handmade by some of the most skilled craftsmen the UK has to offer. We could cut costs (and quality) by outsourcing to China, but we are a company with local values. We do everything we can to support our country, and our local community by having our workshop located in the UK and by working with local businesses wherever possible. 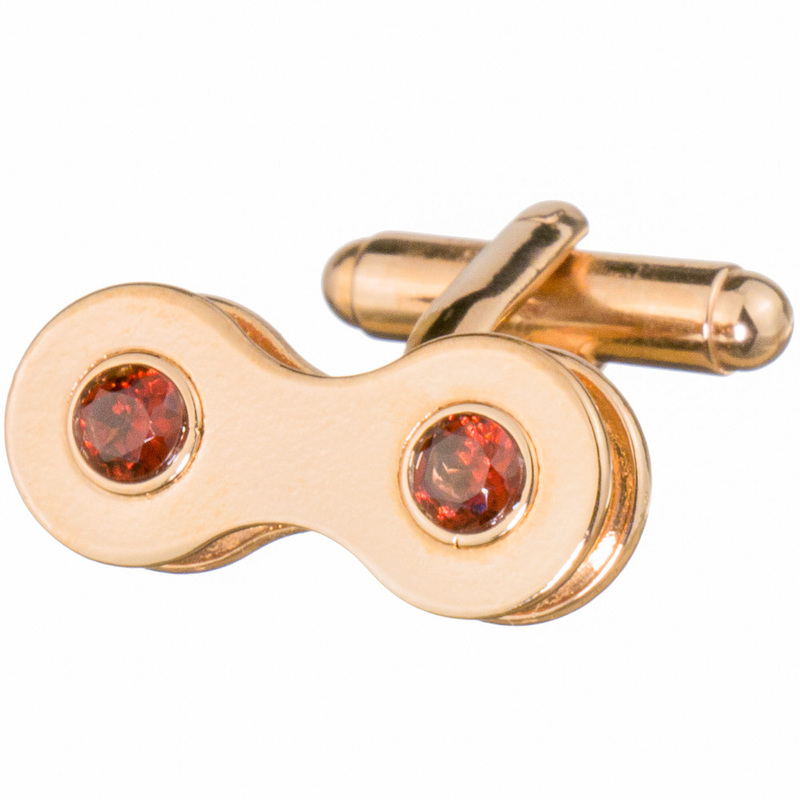 Rose Gold Plated Cufflinks with Mozambique Garnet. We’re a company that takes immense pride in the quality of our work. We use a generous layer of quality silver, gold or rose gold on each cufflink and embed some of the most pristine gemstones mother nature has to offer - 1.3 carats goes into each pair of cufflinks. In addition to using these exemplary materials, our stringent quality control procedures ensure that every product is checked (and double checked) for perfection before it leaves our workshop. We’ve put a lot of time and effort into perfecting the design of these cufflinks. We intentionally made them to be appealing to both our male and female customers. Their timeless design will go well with any outfit, regardless of your gender. Let’s not forget the most important part about these cufflinks, they are simply stunning. The combination of pristine gold plating and exquisite gemstones contrasts perfectly against the traditionally hard and rugged shape of a bicycle chain link. It’s a mesmerizingly beautiful combination. So there you have it, just a few of the things mentioned in the countless lovely comments we have received from our valued customers. If you’ve purchased our cufflinks and want to let us know what you think, we’d love to hear from you. We read each and every email that comes into our inbox and value every ounce of feedback (positive or negative) that we receive.